Digital Displays for Retail: Shoppers Love Digital Signage! Bring an innovative, new dimension to your storefront with ITS digital display solutions. Engage your shoppers from the moment they walk in, with vibrant, high-impact Video Walls. 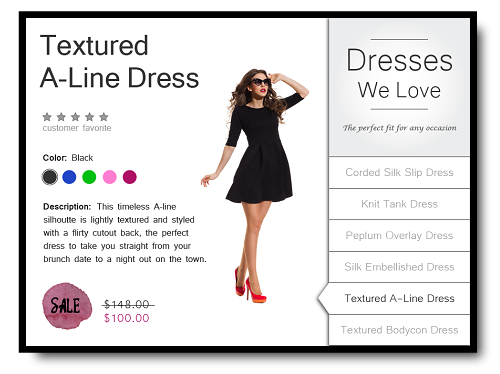 Dynamically showcase your latest inventory and inspire your customers to make a purchase. ITS video wall solutions command attention, drive engagement and establish your presence. Highlight your best-loved products, showcase customer testimonials and more with InfoBoard, an educational resource for shoppers. Beautifully engineered, InfoBoard’s touch screen interface complements your property and invites customer interaction, creating a more relaxed buying atmosphere. For larger properties, enable your shoppers to navigate seamlessly throughout your location with digital building directories. Have a new store opening? Update listings instantly – no additional costs or waiting. Even create additional revenue streams by offering valuable advertising opportunities to nearby businesses. Demonstrate your commitment to customer service, all while generating exposure and increasing revenue with ITS display solutions. ITS provides a diverse offering of solutions to engage & inspire shoppers. Our innovative retail displays are of the highest quality and latest technology. From clothing stores to grocery stores, we know that the right signage to showcase your products and guide your customers is no longer an elective for retailers, but a critical part of the sale. 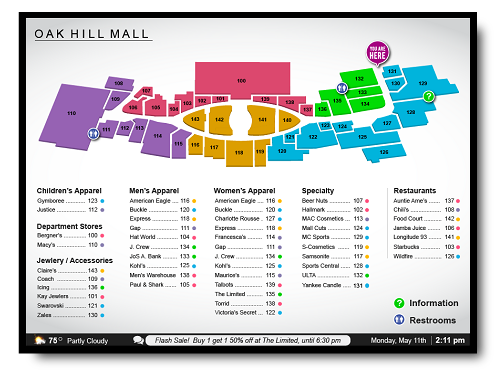 Building directories allow shoppers to navigate seamlessly throughout your retail venue. Highlight on-site shopping, dining, and services, driving additional traffic to all of your profit centers. Update quickly and easily – no additional costs or waiting! InfoBoard is an interactive, visual guide to your storefront. Retailers can showcase new inventory, highlight customer testimonials & more with vibrant, touch screen displays. Create a more relaxed buying atmosphere, as guests are invited to explore your store in a dynamic new way. Create innovative, impactful experiences for your shoppers with Video Walls. Capture your audience – showcase your latest arrivals, promote special offers, and increase sales! 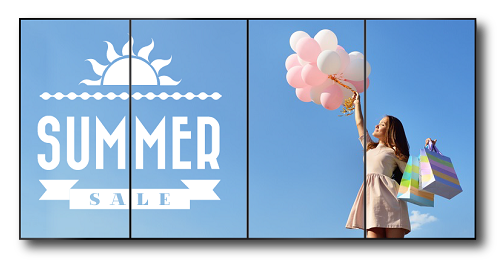 Video walls command attention, drive engagement, and distinguish your storefront. We will be happy to find the right solution for your location.